Yesterday in Dallas, about a dozen police officers were shot and five were killed when a sniper attacked the officers at a protest against police brutality after two high profile police shootings in the days immediately before. The shooting of police is being described as the worst day of violence against police since the September 11, 2001, terrorist attacks. 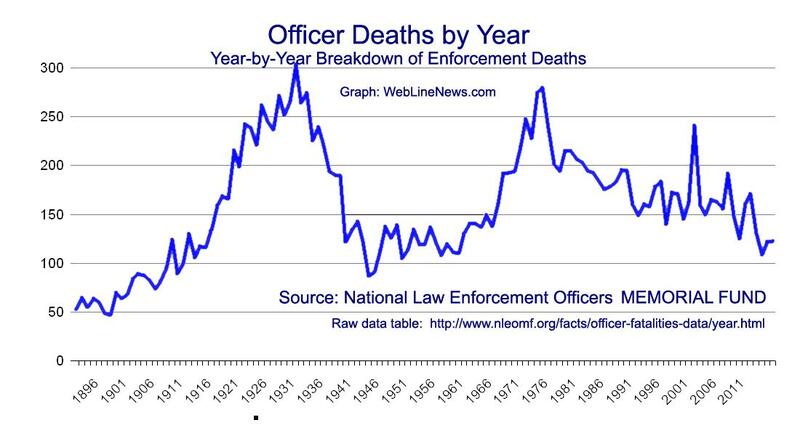 The National Law Enforcement Officer Memorial Fund (NLEOMF) has tallied the number of “Officer Deaths by Year” since 1791. The total tally from then through the end of 2015 is just over 20,000 officers. A table of the data in here. Web Line News presents this graph of the data covering over one hundred years. All lives matter. Police Officer lives matter. And of course, Black lives matter too.